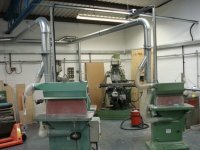 R.A.M Environmental is a small client focused company providing dust and fume extraction services within the Industry and Education areas. We are dedicated to offering Local Exhaust Ventilation in and offer excellent service. We also carry out servicing and upgrades to existing equipment and supply spare parts including Filters, Pulse Valves, Seals, Flexible Hoses and Ductwork to name but a few. For further information on Local Exhaust Ventilation in , please feel free to browse our site or Contact Us, we look forward to discussing your requirements.